The festive season may still be several months away but the Friends of St Edmund’s in Sedgefield have already been hard at work producing ‘the ideal Christmas present’ for anyone associated with the town. Eye-catching images of scenes in and around Sedgefield taken by local photographers have been turned into a full colour, limited edition calendar which will go on sale shortly to help raise funds for the conservation of the church. The calendar will go on sale at £6 which includes a sturdy envelope for posting to friends and relatives. Sedgefield church member Trevor Terry (left), the first person to join the Friends when the group was formed in November 1999 and who still serves on the charity’s committee, is pictured buying the first calendar from Anne Eyley, a member of the team that produced the calendar with local artist and designer Kev Stevens (centre), principal of The Art Room North East Ltd in Fishburn. 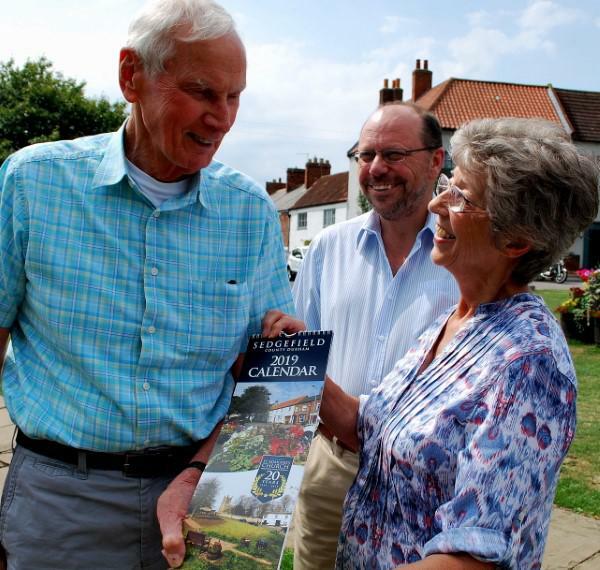 Calendars will be available this weekend from secretary Alison Hodgson, membership secretary Brian Mutch or any member of the Friends’ committee.